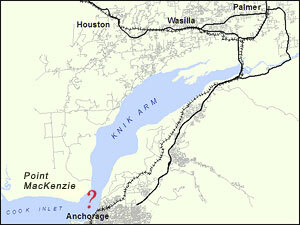 Should we build a bridge across Knik Arm? Is the proposed Knik Arm Bridge a good idea or a "Bridge to Nowhere"? Who will benefit and who will be harmed if the bridge is built? Are there other alternatives that should be considered? What will the bridge cost and who will pay for it? This website provides factual information and documentation to answer these questions. “Cash for Knik bridge gets cool reaction from Alaska legislators.” To view this 2/16/11 ADN story, please click here[Dead link-this story is no longer online.]. “Knik Arm Crossing: A bridge too far?” To view this 2/15/11 Alaska Dispatch opinion piece by former legislator Andrew Halcro, please click here. Or view an archived copy here. “Bridge to somewhere?” To view this 12/20/10 Frontiersman story please click here. Or view an archived copy here. “Knik Arm Bridge project goes forward.” To view this 12/16/10 Juneau Empire/AP story please click here. Or view an archived copy here. “Knik Arm Bridge Gets Federal Approval.” To listen to this 12/16/10 KSKA audio report download the MP3 file from KSKA here. Or download an archived copy here. Jamie Kenworthy, financial analyst, please click on this file: boardmtgtestjk410. Lois Epstein, Alaska Transportation Priorities Project Director, please click on this file: kabbd410. By a unanimous vote, the Mat-Su Assembly passed a resolution supporting the Knik Arm Bridge on April 6, 2010 with several key conditions that must be met. To view Resolution 10-28, please click here. BE IT FURTHER RESOLVED, that there will be a need for road and other infrastructure improvements including Knik Goose Bay Road, Burma Road, and South Big Lake Road on the Matnuska-Susitna Borough end of the Knik arm crossing when the bridge is built. “Anchorage Assembly Votes to Delay Knik Bridge.” To listen to this 3/17/10 APRN story, please click here. The decision-making body for transportation projects, the Anchorage Metropolitan Area Transportation Solutions (AMATS) Policy Committee, today voted 3-2 to keep the Knik Arm Bridge project in the short-term portion of the Anchorage Long Range Transportation Plan (LRTP). 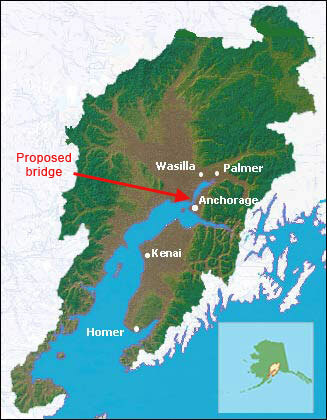 The three advisory committees to the Policy Committee – the Anchorage Planning and Zoning Commission, the AMATS Technical Advisory Committee, and the Anchorage Assembly – each voted in 2009 and 2010 to remove the bridge from the list of short-term projects. The five-member Policy Committee is composed of representatives from the Alaska Departments of Transportation and Environmental Conservation, Mayor Sullivan, and two representatives from the Anchor-age Assembly. The Assembly representatives (Flynn and Selkregg) alone voted to make the bridge a long-term project, i.e., post-2018 construction, because key financial and technical questions were not answered by the Knik Arm Bridge and Toll Authority during its testimony before the advisory committees. Following a public meeting on March 16, the Anchorage Assembly passed by a vote of 6-5 resolution 2010-40 [Dead link, this resolution is no longer online.] which recommends to the Anchorage Metropolitan Area Transportation Solutions (AMATS) Policy Committee that the Knik Arm Bridge be moved from the list of short-term projects to the list of long-term projects in the Anchorage Bowl 2025 Long-Range Transportation Plan.